I’ve added some banner rotators to the site… you can see one on the top of the right column on this page, under the heading “FEATURED CONSPIRATORS.” The one at the right is intended to feature cartoonists and their projects. It starts on a random banner and then slowly goes through all of them. I made 8 banners to start out with (the first 8 sites that came to my mind). The rest of them are up to you guys… this space is free to any conspirators. I’ll post pretty much any banner you send me for your comic projects on the web, limited to 2 per conspirator (unless you talk me into posting more). Just send me the url you want it to link to and the artwork you want to use at 175 x 100 pixels. It may take me a while to get them up, but they’ll be there sooner or later. I’m probably going to post the source files for the banner rotators at some point so you can all make use of them on your own sites, if this sort of thing appeals to you… I’ll have to clean up the code and make them a little easier to reuse first. We have some other useful tutorials and information in our resources section. I’ll be adding links to some of the above resources there as well. Conspirator Doug McNamara was conspiring with other cartoonists long before he joined us… his Mini Comix Coop provides a very useful and fun service for cartoonists. You can simply send Doug 10 copies of your latest mini, and he will trade your comic for you with a bunch of other cartoonists who have sent their work in… generally you’ll get about 10 unique mini-comics from different artists for the ten you sent in. You can read more about how he arranges it here. Here’s a cool bunch of images from exhibitions by the Caroline and Erwin Swann Foundation for Caricature and Cartoon at the Library of Congress. Here’s a hilarious A.B. 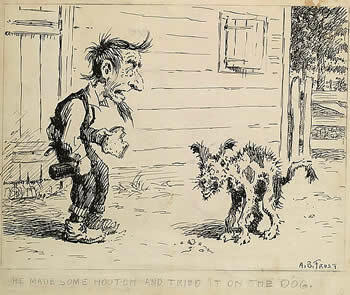 Frost original from the exhibition “Monsterous Craws and Character Flaws.” The caption reads “He Made Some Hooch and Tried it on the Dog.” Click on the image to see a larger version. Comics Disappearing in the City Pages? Subject: Lance Boyle, Maakies, comics??? Steinlicht, only appears once a week, if that). you bring back some of the ones you’ve cut. And how she threw away all your comics when you were a kid by going to your local comic store to celebrate our favorite holiday of the year… FREE COMIC BOOK DAY is May 7th! Apparently there is some other holiday this weekend too. Dinosaurs! Cowboys! Scientists! What more could you ask for? This special FCBD Edition offers a complete short story and tantalizing introduction to the fall’s upcoming graphic novel. 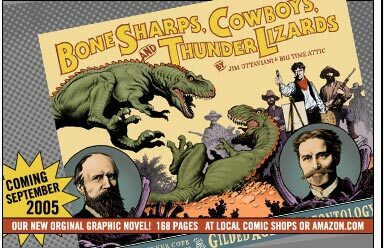 In addition to the cowboys, dinosaurs, and villainous men of science Bone Sharps also features the world-renowned artist Charles R. Knight, Chief Red Cloud and hundreds of his Indian braves, the gun-totin’ & gamblin’ professor John Bell Hatcher, and special appearances by the Cardiff Giant, P.T. Barnum, Buffalo Bill Cody, and a supporting cast of rogues & gallants from the Eastern scientific establishment and the Old West. Cover by Mark Schultz. There are a bunch of other great looking books coming out for the holiday… besides Bonesharps I’m particularly looking forward to SUPERIOR SHOWCASE #0 FCBD EDITION, ALTERNATIVE COMICS PRESENTS FCBD ED 2005 EDITION, COMICS FESTIVAL! FCBD EDITION, THE ADVENTURES OF PAUL FCBD EDITION, FUNNY BOOK FCBD EDITION, and KEENSPOT SPOTLIGHT 2005 FCBD EDITION. You can read more about all of these fine, fine, fine looking books on this page. There are creator signings coinciding with the event all over the country, including at Big Brain Comics, where Shad, Zander and Kevin from Big Time Attic will be signing the Bonesharps book… Chris Jones (Batman Strikes) will also be at the event, signing THE BATMAN STRIKES! #1 FCBD EDITION. I’ve just reserved a space for a Conspiracy pot luck in BOOM ISLAND PARK (B) May 22nd from 9:00 AM to 3:00PM. All cartoonists are welcome, whether or not they affiliate themselves with our conspiratorial asses. This is intended to be a social event… there may be some drawing, but frisbee is just as likely. BYOB, bring food, bring frisbees or whatever outdoor stuff you like to mess around with. Bring your significant others (including kids). You could also BRING YOUR SUBMISSIONS TO WEIRD ILLUSTRATED (Deadline May 23rd) if you’re submitting. Info is below… the policies listed aren’t mine, but the Minneapolis park services… I will not be counting beer points, and the number of beer points collected during the day will be between you and the aspirin bottle. Don’t know if parking fees apply on Sunday or not, but I highly doubt it. Policies: 3.2 Beer only, no kegs. No amplification. Please help out by packing out your trash. No driving or parking on the grass. No staking into the ground. Fires permitted in grills only. Parking at Boom Island parking lots are $.50 per hour. Please recycle using containers where available, Thank You. The deadline for the first Rubber Chicken Funnies anthology, Weird Illustrated, is rapidly approaching… May 23rd is the day. I hope a lot of you are still planning on submitting. You can read the submission info here. Previously completed work is acceptable for submission, although I hope to see a lot of new material. The next Minneapolis meeting of the Cartoonist Conspiracy is at the Spyhouse Thursday May 5th… Cinco De Mayo. The Minneapolis Cell of The International Cartoonist Conspiracy usually meets at 6:30pm on the first Thursday of each month at the Spyhouse, unless otherwise noted on the website. In addition, we meet the third Sunday of every month at Grumpy’s (May 15th this month). Generally we meet, draw jam comics, drink caffeinated beverages, and socialize. Once we’re happy with the jam comics, we usually either go home or go get non-caffeinated beverages somewhere. We’re going to do one 12 page extended jam on a random topic and whatever miscellaneous jams people want to work on this meeting. If you want to suggest a topic to possibly be drawn out of our bag of topics, you can post it here. The last two months of jams have just been posted here and here. The Beatnik Brigade/Modern Day Voodoo/Comic Found on the Bus strip from March turned out really well, I think. I’m planning on bringing at least one of the boxes of 24 hour comics we made for 24 Hour Comics Day to the meeting… if you want to buy one they are ten bucks. It is a limited edition of 100 boxes, each box contains 17 comics drawn in 24 hours on April 23-24 2005, and it will never be reprinted. Let me know if you want one in advance so I can bring it for you.